Waterkloof Restaurant makes its Eat Out Top Ten debut! 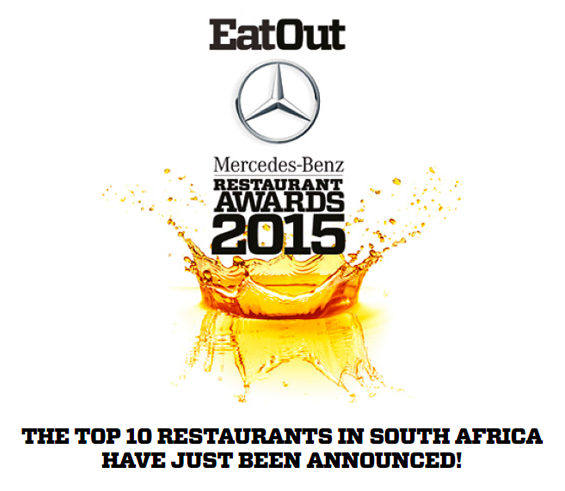 November 16, 2015 Waterkloof Restaurant makes its Eat Out Top Ten debut! 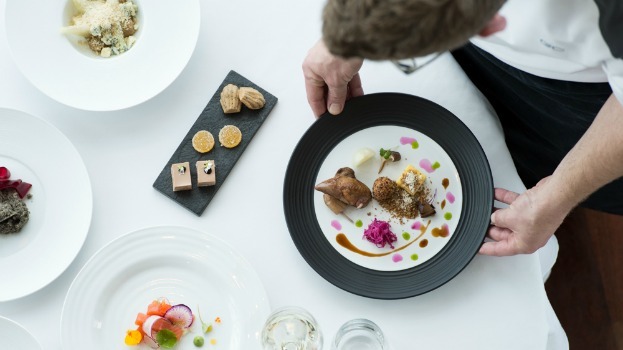 Waterkloof Estate’s signature ‘Restaurant in the Sky’, perched high on the outskirts of Somerset West, has added its first Eat Out Top Ten victory to its culinary cap, by clinching the sixth spot in the esteemed 2015 line-up. Waterkloof Restaurant’s Top Ten debut at South Africa’s ‘foodie Oscars’ came in the same year in which this biodynamic wine estate, overlooking False Bay, celebrates a decade of winemaking and working in harmony with nature to craft wines of vitality, individuality and sustainability. “During the past ten years Waterkloof also earned respect as a prominent fine dining destination and it is great to see that the critical acclaim for our restaurant continues to soar to new heights. 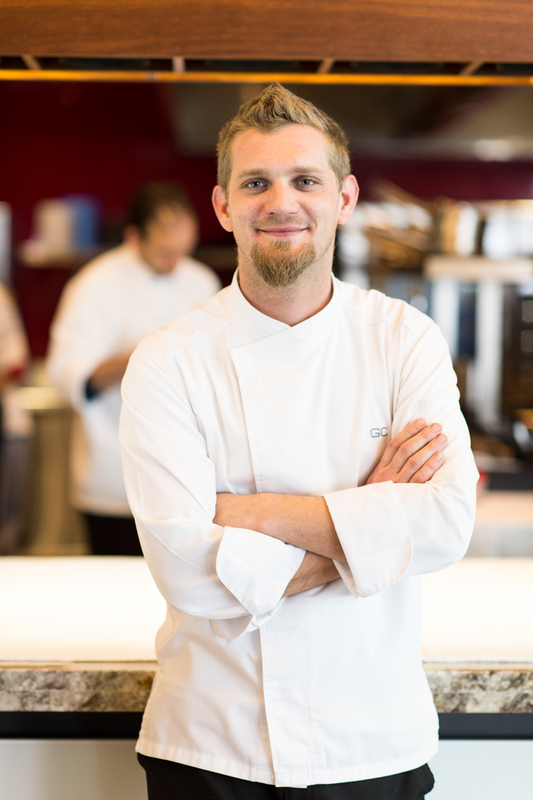 We are literally on cloud nine right now,” shares Chef Gregory Czarnecki. According to 2015 Eat Out Judge Abigail Donnelly “Gregory’s cooking has never been this good” and it shows. Recently, the Waterkloof Restaurant – with its awe-inspiring omnipresent views – triumphed with its 3rd consecutive American Express® Platinum Fine Dining Award. It was also flagged with the highest status – a “highly recommended” tag – in the acclaimed 2016 Rossouw’s by Diner’s Club South African Restaurant Guide. Ticking all the right boxes when it comes to fine dining with a view, the restaurant also earned its 2015 Trip Advisor Hall of Fame stripes for clinching a Certificate of Excellence Award five years in a row. Gregory and his team draw inspiration from the restaurant’s spectacular setting in a 10 metre high glass promontory flowing from the modern wine tasting lounge and gravitational cellar. There, food is art, calling for an unhurried appreciation of unique culinary creations made with the finest locally sourced, seasonal produce. Chef Czarnecki places great emphasis on using only the freshest, seasonal ingredients, such as free-range eggs, farm-reared Schapenberg lamb, and a variety of common and rare herbs and vegetables – many of which are grown and sourced right there at Waterkloof. The restaurant is renowned for its classical cuisine cooked in a contemporary style with a whimsical edge and Grégory’s latest summer menus focus on provenance through a fusion of fresh innovative dishes. Click here to make a reservation for lunch or dinner.